QUIK-TUBE™ Building Form, available in 4-ft. lengths in a variety of diameters, for posts requiring extra supports. 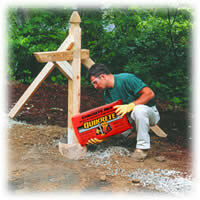 A solid concrete base is important for firmly setting wood or metal posts. Below-ground areas of wood posts should be coated with a creosol equivalent. Metal posts should have a coat of rust inhibitor. Dig a hole about three times the diameter of the post. Hole should go deep enough to encase one third of the length of the post (no more than 3 feet for most posts). If soil is loose or sandy, dig a larger, dish-shaped hole. Tamp the sides and bottom so that the hole walls are firm. You may want to use a QUIK-TUBE™ Building Form. QUIK-TUBEs are rigid fiber forms for setting posts for projects like deck piers, patio footers, dock pilings, heavier fence post bases, etc. Place post in desired position. Braces are helpful in keeping post upright. Place 6 inches of gravel around base. Mix QUIKRETE® according to directions, and pour enough into hole to cover gravel, working it in and around gravel with shovel. Then fill the balance of the hole. Excellent results can be achieved under certain circumstances by pouring dry Fast-Setting Concrete Mix around the post directly from the bag, allowing ground moisture to finish the job. Pre-wetting the hole and pouring in a small amount of water after the dry mix will hasten setting. When standing water has evaporated from the QUIKRETE® Mix, smooth the surface, tapering slightly downward toward the outer edge of the concrete so rain water will drain away from the post. A level or plumb line should be used to ensure the post is straight. Leave braces in place while QUIKRETE® is setting. Concrete should be allowed to harden thoroughly before post is subjected to any strain. Proper curing of all cement mixes is necessary for maximum strength to be achieved. Concrete which has been moist-cured will be approximately 50% stronger than that exposed to dry air. Concrete reaches 98% of its strength in 28 days.